Chickens naturally roam through the garden. Chickens free-range in your garden, usually as a unit. Chickens are sociable and tend to stick together as a flock. Occasionally, you may have a few hens that venture away from the flock. If by chance a hen goes into the coop to lay an egg or gets separated from the rest of the flock, she’s likely to become agitated and to cluck and squawk until she’s reunited with the rest of the flock. Chickens know they’re safer together than separated by themselves. 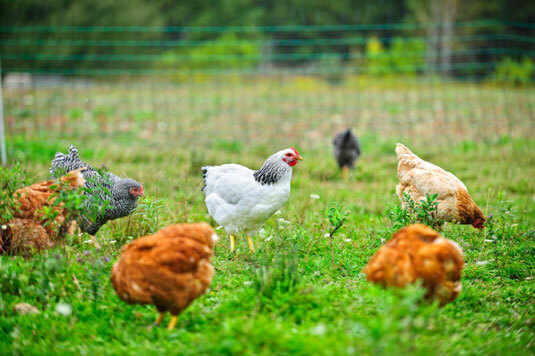 Chickens that have been free-ranging for a period of time will stop in the coop for water if it isn’t provided in the landscape or on the property and to eat some lay feed. Chickens are curious, venturing about their domain to explore. They like to roam and soon have their favorite spots. When a flock is acclimated to its chicken coop and free-range environment, chickens seldom stray from the domains of home unless they’re facing circumstances like a predator attack. Recycling happens naturally with chickens. Chickens are motivated to eat and find food. It is their favorite thing to do. And when they relieve themselves, they’re great recyclers. 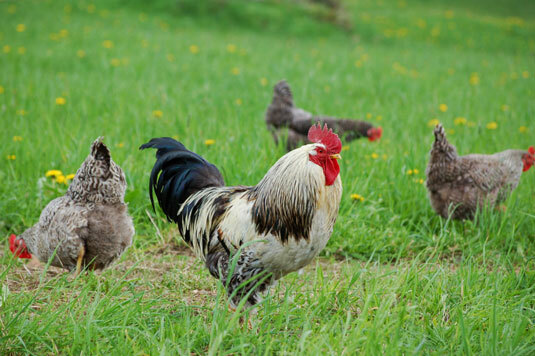 Chickens naturally recycle bugs and pests into desirable manure and tasty eggs. They love your kitchen scraps. They think nothing of investigating other livestock manure. Chickens do occasionally take time out for dust baths. They fling with their feathers loose dirt on their backs, necks, and shoulders. It can take place anywhere in the garden, perhaps under a favorite mature shrub that has warm sunny sandy soil. The dirt is a way for them to clean their feathers. 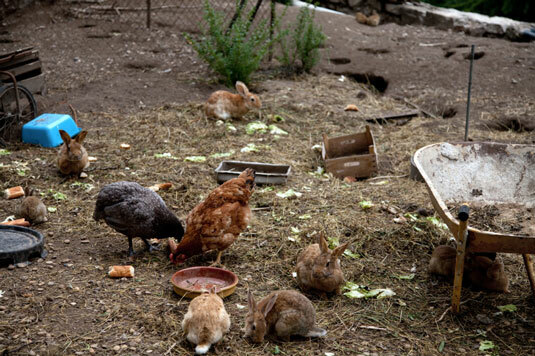 With their dust baths, chickens create a large indentation, sinking below the soil level as much as they can. 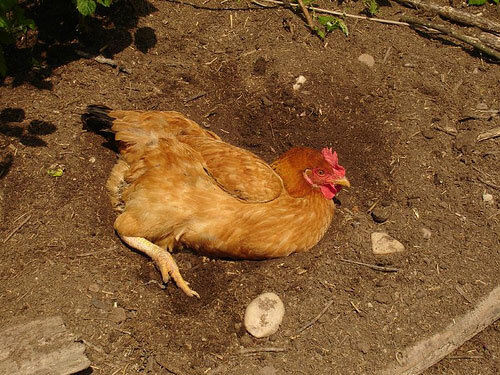 A chicken having a dust bath is a relaxed chicken. If you don’t have a sandy soil type, which is perfect medium for chickens to create their dust baths in, you can create and customize a little dust bath area for your chickens. Find a nice, out-of-the-way spot. Build a square framework with 2×8 boards, and bury the framework halfway into the ground. Fill it with clean sand or a mix of sand and fine dirt. Make it big enough for your chickens to enjoy a dust bath together. Your chickens will love you for it. Chickens are naturally ornamental with their soft, colorful feathers. Just by free-ranging in your garden, they make a pretty sight and add a soothing ambience. Chickens are low maintenance with high appeal.